Today’s baleen whales (Mysticetes) support their massive bodies by filtering huge volumes of small prey from seawater using comb-like baleen in their mouths much like a sieve. 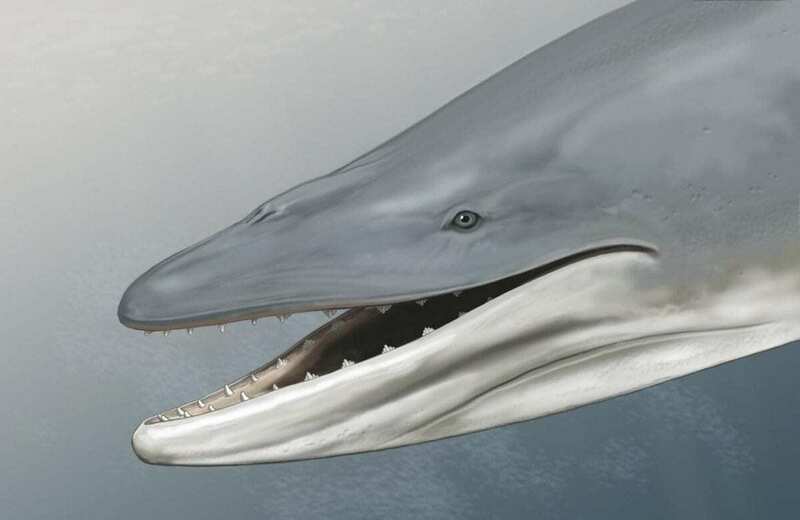 But new evidence based on careful analysis of a 34-million-year-old whale skull from Antarctica–the second-oldest “baleen” whale ever found–suggests that early whales actually didn’t have baleen at all. Their mouths were equipped instead with well-developed gums and teeth, which they apparently used to bite large prey. Like modern whales, Llanocetus had distinctive grooves on the roof of its mouth, the researchers explain, which usually contain blood vessels that supply the baleen. In Llanocetus, however, those grooves cluster around tooth sockets, where baleen would have been useless and at risk of being crushed. The findings suggest that large gums in whales like Llanocetus gradually became more complex over evolutionary time and, ultimately, gave rise to baleen. That transition probably happened only after the teeth had already been lost and whales had switched from biting to sucking in small prey–as many whales and dolphins now do. Marx and Fordyce suggest that baleen most likely arose as a way to keep such small prey inside the mouth more effectively. Soft tissues, including baleen, normally rot away, making it difficult to study their evolution. As a result, researchers must rely on indicators preserved on the bones, such as tell-tale grooves or lumps indicating the position of a muscle, or holes for the passage of particular blood vessels and nerves. In the new study, Fordyce and Marx found that the broad rostrum of Llanocetus had sharp, widely spaced teeth with marked tooth wear suggesting that they were used to bite and shear prey. As in living Mysticetes, the palate bears many grooves, which have commonly been interpreted as evidence for baleen. However, the researchers showed that those grooves instead converged on the bony tooth sockets, suggesting a peri-dental blood supply to well-developed gums, rather than racks of baleen. The findings show that the evolution of filter feeding wasn’t as straightforward as previously thought, the researchers say. They’d now like to sort out when filter feeding and baleen first evolved.